Annina Rüst: "A Piece of the Pie Chart"
A Piece of the Pie Chart is a robotic gallery installation that addresses gender inequity in art and tech-centric workplaces. Inspired by industrial production lines, the project consists of a computer workstation and a food robot. The food robot puts pie charts depicting the gender gap in ratio form onto edible, pre-baked pies. 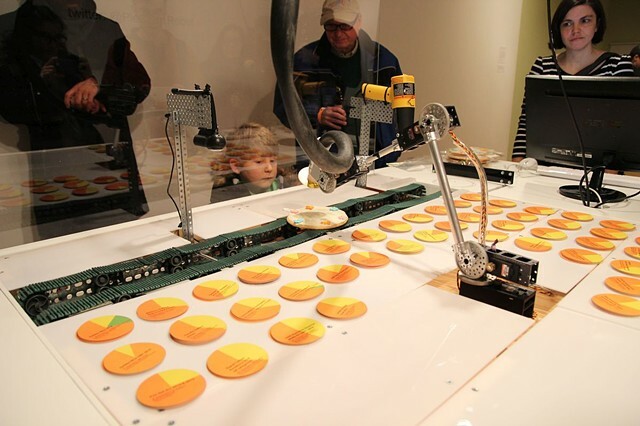 Visitors use the robot to create pies using an automatized assembly line. As part of the process, pictures of the pies are automatically distributed via Twitter. Visitors can then take the pies to their own workplace or mail them to the workplaces where the data originated to remind those in charge how large/small the slice of the pie women can claim for themselves. In A Piece of the Pie Chart, I am combining visualization of gender data in the tech workplace with action and humor. Mapping gender data onto edible pies adds material representation to gender statistics. The pies become a multisensory symbol explaining how women fare in the workplace. This data mapping style adds urgency to the technofeminist cause: It is not a data visualization to be passively consumed; it draws our attention to what the passive consumption of this inequity has produced. What comes out of the machine is an object along with instructions to take action. I see A Piece of the Pie Chart as a mirror of myself, the female tech producer. The machine is a miniature version of an automatized assembly line, a symbol of the industrial revolution, a period in time where great social and technical transformation happened. In my factory-style setup, I am producing not just pies but an audience that will take action towards making art, technology, and society as a whole more diverse and equitable.